SHOOTING THE SHIZNIT : Jon Michael Returns to Wrestling!! ----After almost a four month absence from the ring, Jon Michael returns this weekend. ----After suffering a seizure in July, Jon Michael has been on the road to recovery and return to the ring. On Saturday night in Carterville, IL for AAPW. Michael will be tagging with Stan Lee. Michael told RRO, "It's pretty much a trial match for me to see how my recover rate goes. If all is well, I'll be back on the road all over the place again!" 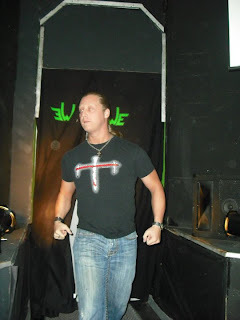 ----Michael during his time off has been working as the promoter/booker of EWE. Saturday night was my first visit since the return of the promotion in Ripley. I was impressed with the improvements of the building. Michael also seems to run a wrestling show, not just a bunch of people on the microphone. The show was right at 2 hours long and he is trying to pride himself in doing a good show within the guidelines of the building owner. ----Michael joined us on July 28th for Conversation. CLICK HERE to read it!